This beautiful property is situated on a private stretch of the golden Pacific beach. Located directly across from the Robert Trent Jones Jr. 18-hole golf course, this resort offers a variety of organized activities and dining experiences. Enjoy the service and quality of Barcelo with the warmth of Mexican hospitality. Optional European Plan is also available. 331 air-conditioned rooms. Standard Room - Garden view room with a balcony, satellite TV, radio, in-room safe, room service 24 hours (fee), two doubles or one king bed. Ocean View - Balcony, satellite TV, radio, in-room safe, room service 24 hours (fee), two doubles or one king bed. An a la carte restaurant (on the All-Inclusive plan, guests can dine at the Sunset Terrace once per stay with prior reservations). A restaurant and pool bar serving lunch and beverages. Featuring excellent gourmet Mexican specialties and a variety of fresh seafood items to the accompaniment of soft Mexican music. Offering informal dining from 7:00 am to 11:00 pm in the open-air atrium lobby, where a Mexican buffet breakfast is available daily. 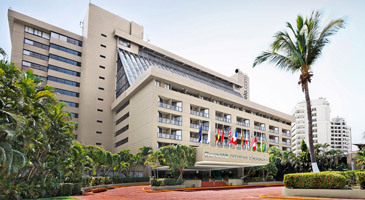 The dramatic design of the Barcelo Ixtapa Beach Resort complements the natural beauty of the landscape, with spacious, air-conditioned rooms housed within twin 12-story towers that rise gracefully above the sea and a sun-filled atrium. This resort is located directly across from a Robert Trent Jones 18-hole championship golf course, and offers complimentary tennis on four courts, a fitness center, organized activities, a Lobby Bar with live entertainment, and the Sanca Bar Nightclub. 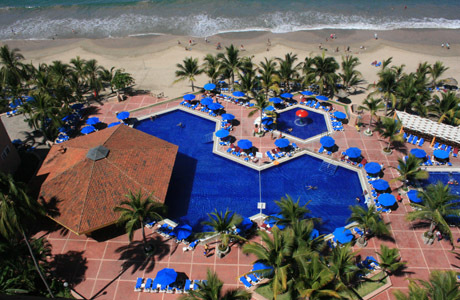 Barcelo Ixtapa Resort is a sports-lover's paradise and a vacationer's dream. Nestled between emerald mountains and the blue Pacific Ocean, on a beautiful palm-lined beach, just four miles from the quaint fishing village of Zihuatanejo. The resort borders a beautiful stretch of palm-lined beachfront. Four tennis courts, a dive shop, and a children’s club are just a few of the recreational services/activities available on site. Other services include a gift shop, beauty parlor, massage and medical services, childcare, and laundry service.